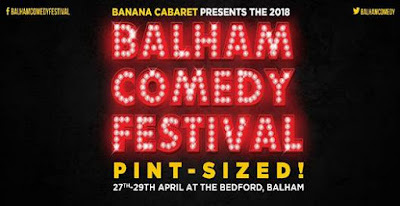 The Bedford has been home to the Balham Comedy Festival since its inception in 2012 and as in previous years will be hosted by John Moloney the award-winning comedian, founder and festival co-producer with Banana Cabaret’s Dave Vickers. John’s comedy hit The John Moloney Show on BBC Radio 4, has recently been recommissioned for its third series and if anyone missed the first series it is currently enjoying a replay on BBC Radio 4. The 2018 Balham Comedy Festival will also include stellar comedy line ups for Best of Bananas on 27th and 28th April that will include Joe Pasquale, currently getting rave reviews for his performances in the touring theatre revival of Some Mothers Do ‘Ave ‘Em, Angela Barnes, Imran Yusuf, Roger Monkhouse, Paul Tonkinson, Tania Edwards and Carl Donnelly. 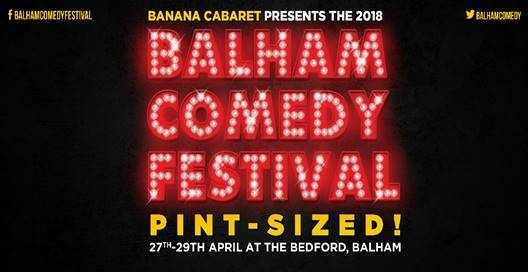 Tickets will be on sale from Tuesday 20 March at 9.00 am to Banana Cabaret subscribers and on general sale from Thursday can be purchased from 09.00 am via the Balham Comedy Festival website or the Banana Cabaret website.